The start of an outsourcing partnership is an exciting time for an original equipment manufacturer (OEM) – but it’s also one that’s filled with unknowns. So, it’s worth finding out as much as you can about what will happen during the important early stages of your outsourcing venture – namely, the first six months. 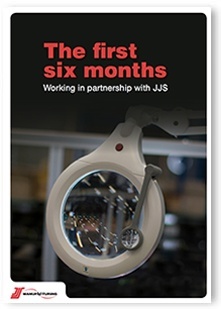 Here at JJS Manufacturing, we focus on creating a stable supply chain and manufacturing environment during this time. Fill out the form and get your copy now! Your privacy is important and we will never share your details with a third party. When you download one of our eBooks, reports or guides, we may occasionally send you further blog or content offers that we believe you may also find interesting or helpful. We hope that's a reasonable expectation on our behalf and you can choose to opt out or change your preferences at any time.